Full details of how this magnetic miracle works. Enlightenment is a revolutionary way of using magnets to create the illusion of levitating a playing card or a dollar note. This 100 page ebook gives you all of the details. Learn the back history, how a simple advertisement in a catalog inspired the idea. 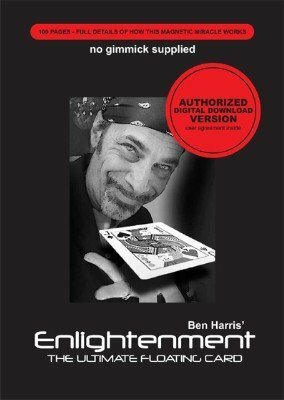 Learn how to operate the gimmick, how to install it in a deck of cards, and how to use it to make a dollar bill float. You'll still need to purchase a gimmick in order to perform this, but if you've been teetering on the edge, wondering if Enlightenment is right for you, this fascinating ebook may hold the answers. 1st edition 2008; 104 pages.